Band I rehearsing for Lionel Hampton. Last night, the Garfield High Jazz Band played its annual “Farewell to Seniors” concert. My son Emmett is among the 20 musicians who are graduating from high school (tomorrow night-yikes) and leaving this amazing program. 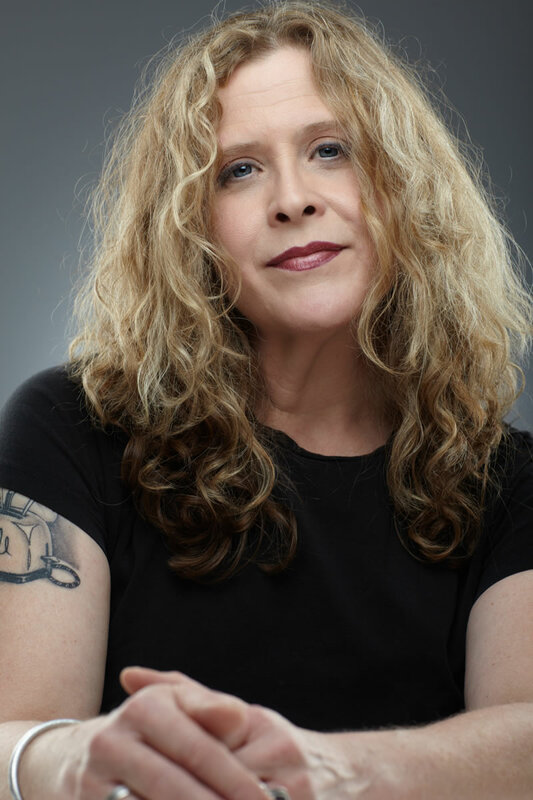 As I sat in the Quincy Jones Performing Arts Center, I was flooded with an odd mix of melancholy, pride and satisfaction. It almost feels like waking up from a beautiful dream. As I write this today, I seem to be at a loss for sufficient language to talk about this extraordinary program or to express my depth of gratitude for Emmett’s experience therein. I grew up in a small town in Oklahoma and played alto saxophone. The only option for musical education in high school was to join the marching band, which was basically ornamentation for the football team. Marching around on a football field was a musical turnoff for me and the love of playing my horn was lost in the abusive rants blasting from the megaphone of our tyrannical band director. I gave up playing and I didn’t discover jazz until I was off to college. Even before Emmett enrolled at Garfield, I was amazed and heartened that a public high school music program would be so well supported and celebrated. Even more significant to me was the high level of music that the Garfield Bands were playing year after year. Clearly, this is one arena where my son was going to have it better than I did. For that, I was and am thankful. Of course, the muscle of support for the program comes from the Garfield Jazz parents. This is one high-octane group of people. If the band needs anything, this bunch makes it happen… pronto. Their fundraising prowess is, if anything, a force of nature. 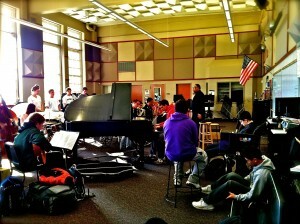 However, the heart and soul of the Garfield Jazz program really lies with its director Clarence Acox. Acox leads with kindness and is unflinchingly positive. He possesses a presence, albeit quite gentle, that commands an instantaneous respect. He speaks directly to the very best in the kids and in turn, they give him their very best. His connection to the music is both encyclopedic and passionate; he embodies the essence of the greats such as Ellington and Basie and inspires his students accordingly. It would not be exaggerating to say that Clarence Acox has taught more than a few generations of young Seattle musicians the meaning of swing. It has been a real pleasure to watch Emmett come up through the ranks of the Garfield program. Like most freshmen, he started out in Band III (under the tutelage of Jay Thomas & Scott Lytle), spent another year in Band II and ultimately secured a spot in Band I, where he played for two years. I’ve lost count of all the concerts, trips and awards throughout these past four years. They’re simply too numerous. But I can recall many memorable moments such as the time Emmett sent me a text informing me that Band I had just won top honors at the 2010 Essentially Ellington competition in New York City. I was sitting in a class at U.W. and literally squealed. (Thank goodness my instructor and classmates were good-humored about the outburst.) I also will never forget how proud I felt watching Emmett play on the Hamp’s Club Stage after he was named as one of the outstanding soloists at the Lionel Hampton Jazz Festival earlier this year. For a mom, it doesn’t get much better than that. But not every moment was as brilliant as these. In fact, we had a few challenges along the way. During his sophomore year, Emmett got into some unfortunate shenanigans on a trip, prompting a serious call home from Acox. But in his wisdom, Acox allowed Emmett the opportunity to course correct and learn from his misstep. To me, that is the mark of a true teacher. During Emmett’s time with Garfield Jazz, our family was undergoing its own difficulties, which at times made the normal rough waters of parenting a teenager all the more tumultuous. However, no matter how turbulent things got, the jazz band kept Emmett grounded. He’s even told me that if it weren’t for the Garfield Jazz program, he probably would have simply dropped out of school and gone for his GED. Some say it takes a village. In this case, I’d say it took a jazz band. I am so grateful for everything that Garfield Jazz and Clarence Acox have given to my son, both musically and personally. 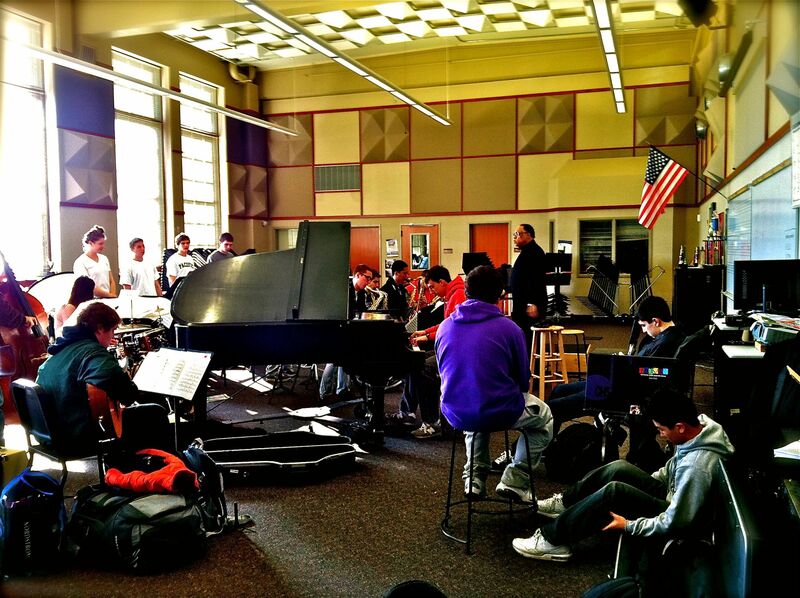 Emmett still has one major tour with the Garfield Jazz Band. This summer, he is traveling with the band to Europe, where the kids will play at multiple festivals throughout Italy and France. This seems like a wonderful way for Emmett to wind down what has been an amazing, four- year odyssey. For me, however, the Garfield gig is up. Last night was the last time I will ever see Emmett play with the band. Of course, there is a small, melancholy tug at my heart. How could there not be? But as I said at the start of this post, I also feel a sense of pride and satisfaction. At only 18 years of age, Emmett has already played at a level that many musicians can only dream of. And if the Garfield High School Jazz program is any indication, I would say that the future of jazz is in very good hands. But man, did that go fast.